Matt Crafton, driver of the No. 88 Ideal Door/Menards Toyota Tundra made his 16th career start at Atlanta (Ga.) Motor Speedway (AMS) in Saturday’s NASCAR Camping World Truck Series (NCWTS) Active Pest Control 200. Starting seventh, the ThorSport Racing driver showed his strength throughout the 130-lap event finishing third in Stage 1, fifth in Stage 2, and bringing home his fifth top-five finish at the 1.54-mile track, finishing second. Battling a Toyota Tundra that was “tight through the center and off the corners,” Crafton and crew chief Carl “Junior” Joiner, worked on the handling of his Menards Toyota Tundra throughout the event. In the closing laps, Crafton would lead the 32-truck field twice for two laps, but fall to second with 11 laps to go, and the 2015 AMS race winner would eventually cross the stripe second, behind race winner, Christopher Bell. The solid run was Crafton’s fifth top-five finish at AMS. 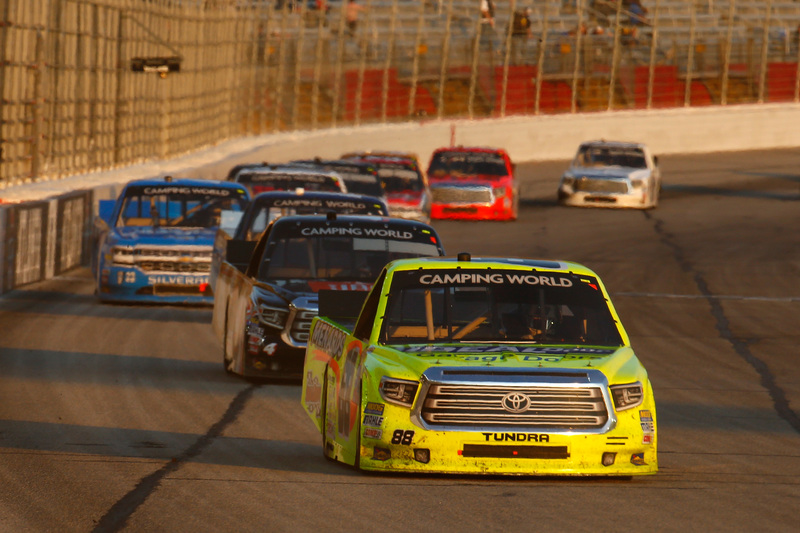 The NASCAR Camping World Truck Series (NCWTS) had three practice sessions on Friday in preparation for Saturday’s Active Pest Control 200 at Atlanta Motor Speedway (AMS). Matt Crafton was seventh, eighth, and seventh, respectively. Saturday’s Active Pest Control 200 marked Crafton’s 16th start at the 1.54-mile track. Starting seventh, Crafton led the field twice for two laps and finished second in the 130-lap event. In 16 starts at AMS, Crafton has one pole (2016), one win (2015), and has led 173 laps en route to five top-five and 11 top-10 finishes. In 386 career starts, Crafton has 12 poles, and has led 2138 laps en route to 13 wins, 98 top-five, and 227 top-10 finishes. Crafton’s ThorSport Racing teammates finished fourth (Rhodes), eighth (Enfinger), and 16th (Coughlin). Up next: The Alpha Energy Solutions 250 at Martinsville Speedway on Saturday, April 1.